Readers will be aware that like a sinner repented, Cloudwater Brewery has returned to the cask fold after a period in the keg wilderness. It is good to see them back and to note they will shortly be joined by that other recidivist - sorry - returner to the shining path - BrewDog. Is this the shot in the arm that the ailing cask cause needs? I'm not sure, but it can't do any harm can it? Actually in the case of Cloudwater whose decent intentions are rarely called into question - certainly not by this writer - no it can't. In the case of BrewDog, let's wait and see. Cloudwater has been seeking out pubs where their cask credentials are such that they will look after the beer properly, going as far as having a little interactive online map where you can seek out those who know how to coax the best out of beer from the wickets. Additionally, a vetting process, which while hardly the Spanish Inquisition, at least gets enough information about prospective sellers of the amber nectar to judge whether they'll turn it into flat vinegar or not. Good idea. Quality at point of sale is paramount and Cloudwater are to be praised for making such efforts as they have in the name of a quality pint. One such pub whose cask credentials are proven beyond doubt is the Flying Horse in Rochdale, CAMRA's Greater Manchester's Pub of the Year. On Wednesday night they had all four of the new beers on so as it is one of my usual Wednesday haunts, I nipped in to see what was what. This was rather a low key affair, with the pub being little busier than it normally is, though I noticed one or two local members of CAMRA throwing their heads round the door, specifically to try the beers. On offer were Pale, DDH Pale, Brown Ale and India Porter. 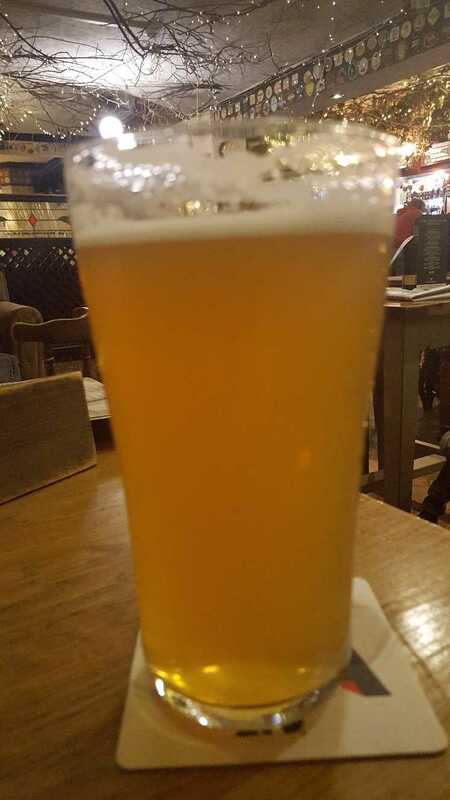 I started with a pint of Pale, a 3.8% golden brew which was decidedly murky. My companion had the same and we sipped cautiously. First impressions were good with a burst of fruit and hops, but as the head subsided, the beer was a tad grainy and watery and sadly became less enjoyable. It lacked the cleanliness and distinct flavours that I'd hoped for. Frankly I blame the needless opacity of the beer - but see below. This beer cried out to be cleaned up. Cautious by now, my next beer, DDH was ordered in a half portion. This looked and smelt similar to the Pale, but with a slightly soapier nose. The taste was more of the same with the hops not seeming to get along with the malt. The increase in alcohol to 5.5% was evident, but didn't help the cause that much. Again the beer seemed muddy, a little thin and imprecise. I didn't care for that one much at all. I was getting worried by now. Brown Ale (4.6%), hardly my favourite style was next. Having had a taster and observing its pin bright clarity though, a pint was duly ordered. Now this was more like it. Full bodied, resinously hoppy throughout and with clean and distinct flavours, this was a beer of tremendous complexity and vibrancy. It was multi layered and classy and quite possibly the best example of a brown ale I've had in years. A lovely beer. Buoyed up by the Brown Ale experience, India Porter was next. Would it reach the heights of my previous one? It did and in fact soared above it. No mean feat. Again clear, very dark, full of condition and a head a dormouse could have walked over without sinking in, it looked a treat. Frankly this is a stunningly good beer. A booming joy from start to finish. Resinous hops throughout, delicious dark malts and such a clean tasting beer. A modern take on porter which knocks all the sweet, dull efforts you normally see into a cocked hat. It had great drinkability too and at 5.3% I felt its strength was pitched just right. I loved it. So what does this tell us? A few things. Cloudwater can brew bloody good beer and haven't forgotten how to do cask. The two beers I didn't like prove little. I and my ilk aren't the target audience for them. They are to keep their core audience onside while introducing them back to cask with something familiar. While I didn't like them, plenty will and I have little doubt they turned out as intended. Cloudwater are too good for that not to be the case. Getting not one, but (if you include BrewDog) two two high profile breweries back in cask production with an enhanced committment to quality at the point of dispense can only be good. I look forward to more; just tone down the cloudiness guys. To me it makes the beer taste cleaner and that is a good thing, though I reluctantly accept its all pervasive influence these days. Conclusion? Mine's a pint of India Porter if you are buying. Even if you aren't, it still is. So we have Cloudwater back on board cask wise and BrewDog too. I'll try that next week in London and hope for the best. I'm glad I tried these beers at the Flyer. Tremendous condition is assured there. All beers were a very reasonable £3.50 a pint. In fact for the quality of the Brown Ale and the Porter, worth a fair bit more. Apparently they had sold very well during the day, which is good news. Those pumpclips aren't exactly going to grab your attention across a crowded bar, are they? They have thought sensors. Straight to the buying part of your brain. I appreciate you were drinking but the Pale was actually 4%. It's good news, some of their (and BrewDog's) cask was superb. 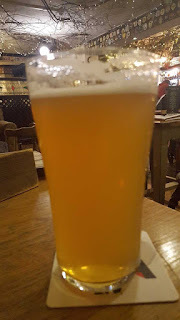 I hope there's enough demand for the beers to sustain quality after the initial buzz this week and we see their beer in more than a few dozen selected outlets, though frankly I don't blame them for only selling to places they can "audit" or whatever word suits. Surprised by how cheap it was (I paid premium rates for the Bitter a few years back); bet it isn't £3.50 in Covent Garden and Cambridge. I like the pump-clips in a strange sort of way. Like a Turner water-colour, they are very atmospheric, and definitely set the scene. As TM says, they draw your eye in with their intriguing look, and would certainly entice me to buy; even if I knew nothing about the beer. Is there a definitive list of places that are stocking the Cloudwater cask? Ideally I'd like to get all four in the same place with minimal effort. *MOST* venues on that map have all four. (But not all.) By tonight I suspect many will have run out mind. It was a pretty limited release and few pubs got more than 1 cask of each. It's quite interesting to be observing all the different responses to the different beers. I am seeing both love and hate for the DDH for example. Personally I rather liked it (but I like this sort of thing) and had a second pint on my Wednesday encounter with it. I very much liked the India Porter too. Sadly not had the Brown or Pale yet, such is the life of the working beer wrangler - too much wrangling, little drinking. Fingers crossed both are still on and still good in my local tonight. Word in the street is the next cask effort is an ESB, if it's as good as their last cask effort at ESB it'll be... well good. 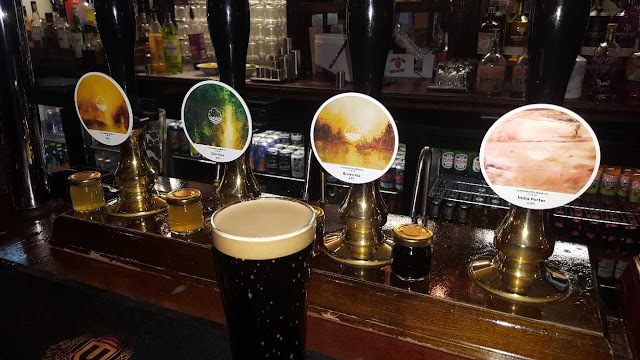 Saw two pubs with it in London last Tuesday, The Harp had the Brown Ale and Indian Porter on, The Wenlock Arms had three, Pale, Brown and I think The Porter but not sure, only tried the Brown Ale in the Harp, which was excellent, wish now I had tried the others. Re the pump clips although not loud they are quite distinctive and drew my eye immediately. Tried all 4 at the Shakespeare in Sheffield. Thought the DDH was the pick of the best and wished I'd had a pint. So nice I'd order it without thinking in any pub I saw it in. Glad you enjoyed the Brown - my favourite by far. The DDH and Pale both need a little work, but I'll see what I can do. I imagine you'll very much enjoy the *Something* Special Bitter we've just casked. It was tasting brilliant in FV. They had the same beers on in the Crown and Kettle on Thursday evening. I only tried the Brown Ale but have to agree, it was a lovely beer - one of the nicest pints I've had this year. Thanks for sharing such great information with us. I hope you will share some more info about "Sports bar". Please keep sharing.